Round, citrus fruit consisting of an orange colored outer rind, and an orange colored inner segments, pith and small seeds. Oranges can be eaten by first removing the rind, or they can be juiced. The rind can also be grated and used to flavor cakes and other baked goods. It is very nutrious, with high contents of vitamin C, folic acid, potassium and flavanoids. Round thick skinned juicy edible fruit that is a reddish-yellow color when ripe. 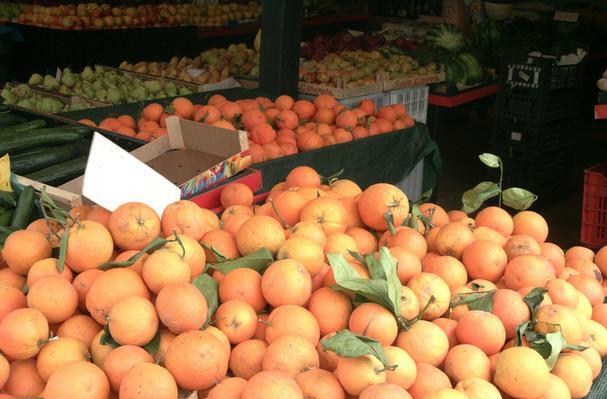 Procuring: Oranges grown for commercial production are generally grown in groves and are produced throughout the world. The top three orange-producing countries are Brazil, the United States, and Mexico. The outer-most layer of the rind can be grated or thinly veneered with a tool called a zester, to produce orange zest. Zest is popular in cooking because it contains the oil glands and has a strong flavour similar to the fleshy inner part of the orange. It is also used in certain recipes as flavouring or a garnish. Cleaning: The fruit is commonly peeled and eaten fresh, or squeezed for its juice. It has a thick bitter rind that is usually discarded, but can be processed into animal feed by removing water, using pressure and heat. Store them at 12 degrees Celcius (=57o F) or if you like in the refrigerator. This is nice when you use them for squeezing. History: Oranges originated in Southeast Asia. The orange is cultivated over thousands of years now. It is supposed to originate from South- and indo-China. was a seedless mandarin with a looser skin thus easier to peel: the clementine. (beginning of the 20th century). The satsuma is a special crossing from Japan.